Last week at my Farmer’s Market there were huge bunches of field grown coriander for sale at a ridiculously cheap price. I needed coriander, but wondered how on earth could I use such an enormous quantity before it went slimy in the fridge. I knew I’d find a way so handed over my $2. This coriander unlike the hydroponically grown product was vigorous, long stemmed, large leaved and intensely flavoured. I used lots of fresh leaves in the stuffing of the bánh xèo I made last week and I topped a Lucknow style chicken biryani with a large handful freshly chopped, but still I had over 1/2 bunch remaining. In a light bulb moment I thought of Coriander and Peanut paste. I dare not call it pesto as the flavours are purely Asian, but I was however inspired by pesto Genovese. My Peanut and Coriander paste began with peanuts chopped in the food processor with a large knob of ginger and a whole red chilli. After I had added the coriander, the fun began. Recipe development is all about tasting, I love this part. The pesto needed salt so I added fish sauce, I squeezed a fresh lime and added the juice for a kick of acidity, kecap manis ( sweet Indonesian soy,) contributed umami, then a little brown sugar balanced out the flavour. I added peanut oil until I had a thick dolloping consistency. Fresh, lively and aromatic is the only way to describe the flavour of the paste I made. I would be a fabulous dressing for rice noodles, be wonderful with charred pork and delicious with steamed chicken. I pan fried some meaty fillets of barramundi then topped them with a generous dollop of the peanut and coriander paste. Served it on a bed of steamed Asian greens, dinner was on the table in 15 minutes. This fabulous paste is set to become a regular in my kitchen. With the top surface sealed with oil, it will keep for a couple of weeks. I’m planning on serving the remainder as a dip with carrot, celery and cucumber sticks. Put the peanuts, chilli and ginger into the bowl of a food processor and process until finely chopped. Add the coriander and process until finely chopped. Add the sauces, sugar, garlic oil and lime juice and process into a paste. Taste and adjust the seasonings if necessary. With the motor running add the peanut oil and process until the mixture is emulsified. You have such a flair for flavor! Lovely flavour profile in this pesto Sandra. Can imagine it would be fab with a variety of grilled meats, or scooped up as a chunky dip as well. Oh methinks this will be copied far and wide! Fabulous recipe! And for me it is ‘pesto’ or paste . . . . . am ‘funny’ that way . . . 🙂 ! Now to go find a big bunch of coriander since two dollars would not get me anywhere here . . . Thanks Eha. We loved it, sometimes the cooking Gods are with you..
What a fabulous recipe Sandra! I love all of the elements of this pesto! Fabulous! Lovely pesto ! Like your choice of ingredients in here, will try this version as a side for my idli or dosa. What an interesting flavor profile. I think it would be stupendous with noodles. Well done! Oh, lovely. 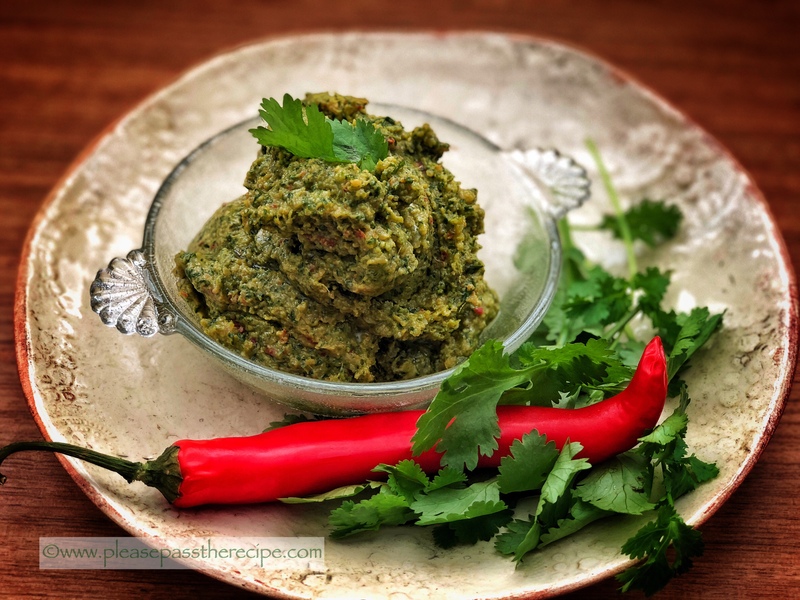 I make a coriander ‘chutney’ or ‘pesto’ (semantics!) with walnuts, but just having had satay last night (as I am back in the UK), peanuts seem pretty good here, too. Must give it a try. Bit envious about that coriander! Delicious! I love coriander, and loved walking through entire fields of it in India. I could use this with/on anything. I could probably just eat it by the handful! Here in Northern France I like to drive to the farm to pick vegetables, and they have coriander in the field for a short while. The rest of the year it’s the hot house grown kind, still tasty… but not the same. This entry was posted on June 21, 2018 by ladyredspecs in Cooking, Dairy Free, Dips and Spreads, FODMAP diet, Food, Gluten Free, Lactose Free, recipes, Sauces, side dishes and tagged coriander, gluten free, lactose free, low fodmap, peanut, pesto.